When a Chinese firm bought the world’s largest pork producer, Smithfield Foods, two years ago, critics worried about U.S. employment, food safety and other issues. After two years under Chinese ownership, the Smithfield company is doing well financially and employment is growing. Chinese investment in the United States has surged over the past 15 years, particularly in real estate and hospitality. These investments are only part of the huge and complex relationship between the world's two largest economies. The sometimes contentious relationship will come under particularly close scrutiny September 25, when Chinese President Xi Jinping meets with President Barack Obama at the White House. Smithfield Foods is one example of those Chinese investments and the company has some of its many facilities and its headquarters in the small, rural, historic town of Smithfield, Virginia. The community of Smithfield is surrounded by farms and cornfields, and corn feeds the pigs that the company turns into all kinds of fresh and packaged meat products. Trucks make their way around the Smithfield Foods packaging plant in Smithfield, Virginia, May 30, 2013. It takes complex machines and skilled people to operate the world’s largest pork producer. Over in the past two years, Smithfield Foods says it has expanded its workforce by nearly 1,300, bringing the total number of employees to more than 48,000. 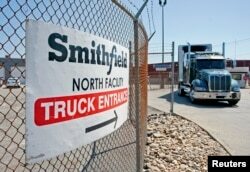 This workforce, which operates in many U.S. states and several nations, helped Smithfield hit a $15 billion sales record in 2014. While the firm is adding people, it is also cutting debt enough to impress the Standard & Poor's agency, which raised Smithfield’s credit rating. At the time of the sale, some Smithfield residents were worried that the change could hurt the U.S. and local economies. John Edwards, publisher of "The Smithfield Times," says the biggest worry was that the company might move its operations — and thousands of jobs — elsewhere, devastating this community of 8,000. “It had to do with the fact that China is a communist country. People didn’t trust the idea of China owning our biggest industry," he said. In Washington, Wilson Center scholar Shihoko Goto says China's acquisitions differ from those of other nations because many Chinese business entities are state-owned and driven by national as well as economic interests. She also says some Chinese companies have been hurt by scandals over tainted food, raising concerns that U.S. food standards might be hurt by Chinese ownership. Those concerns and worries that the sale might undermine the long-term competiveness of the U.S. pork industry prompted U.S. Senator Debbie Stabenow (D-Mich.) to hold hearings on the Smithfield sale in 2013. At that time, Smithfield Foods President Larry Pope said Shuanghui, the Chinese company buying Smithfield, promised not to cut workers' wages and benefits, and keep the current management team in place. He said the Chinese company, which has since changed its name to WH Group, also promised to keep Smithfield's headquarters in the small town that gave the firm its name. In a written statement, company officials now say all of those promises are being kept. 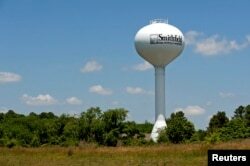 A water tower with the town slogan "ham, history and hospitality" rises over Smithfield, Virginia, May 30, 2013. The town of Smithfield was established in 1752, which is very old for a community in the United States. Main Street features statues of U.S. founding fathers George Washington and Benjamin Franklin, as well as a carefully-preserved centuries-old courthouse. But Smithfield Mayor T. Carter Williams says so far, he has seen few changes and no apparent problems. “Nothing has happened at all. It is exactly the same. In fact, actually, it is right much better,” he said. Williams says city tax receipts are up slightly and that the company is looking for more office space for additional employees, though Smithfield Foods would not confirm that.